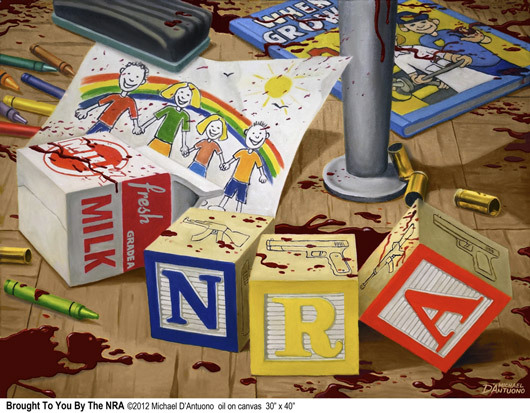 Michael D’Antuono’s latest artwork, called “Brought to You By The NRA,” paints the picture of a children’s classroom covered in blood splatters. In the painting, the letters “N,” “R” and “A” can be seen on wooden blocks, with guns etched into the sides. Bullet shells are painted directly behind them. The playing blocks lay alongside other classroom items like crayons, a drawing and a children’s book, all covered in blood. “Unfortunately, it requires an image as repulsive as the reality to jolt people into pressuring our politicians to put our children’s lives over their campaign contributions from the NRA,” said D’Antuono, in an email to BostInno. According to the artist, he was “greatly dissatisfied” with how representatives from the NRA handled a recent press conference, following the mass shooting in Newtown, Connecticut, where more than two dozen innocent people were gunned down by an assailant with a high-powered weapon. In the days following the attack, the NRA called for armed teachers in classrooms nationwide, and blamed the media and others for the violence, rather than a call for change to current federal gun laws. The NRA’s lack of accountability, he said, inspired him to paint the gruesome mural. This isn’t the first time D’Antuono’s artwork has turned heads, however. The artist’s painting, “The Truth,” which depicts President Barack Obama crucified like Jesus Christ, stirred debate first in New York City and later here in Massachusetts, after it was recently put on display at Bunker Hill Community College. Although some viewers called the Obama painting “blasphemous,” it got them thinking critically; something D’Antuono hopes his latest work can do. D’Antuono isn’t the first person to call for changes to gun laws by using powerful imagery, however. Recently, Stop Handgun Violence, a Newton-based non-profit organization, posted 20 imprints of children’s hands on a massive billboard in Boston— one for each of the children gunned down at Sandy Hook Elementary School.